Little Boy In Pool With Ball. I like this very sweet, very innocent, one of a kind monoprint of a little boy in a wading pool holding a red ball. I love his perfectly round little head and I love the expressive, misty, watery colors. I have added some pastel to this monoprint. It is unframed but will need to be framed to protect it. 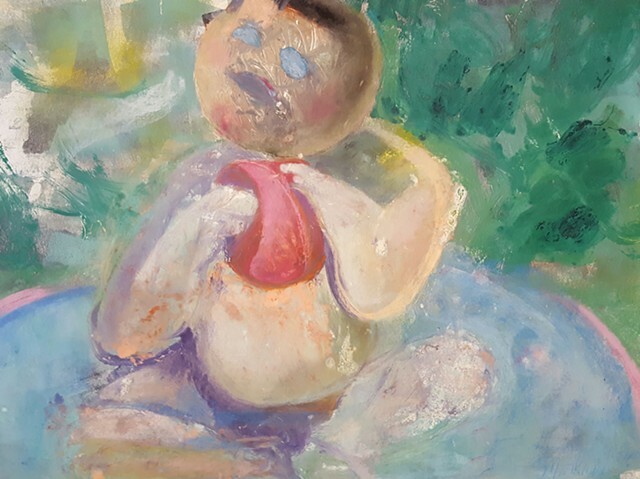 Monoprint, drawing, figure drawing, expressive drawing, impressionism, collage drawing, emerging artist, modern figure drawing, contemporary figurative art, contemporary figurative drawing, mixed media drawing, child in wading pool with ball, little boy in wading pool with ball, colorful, bright.